Worldwide pensions are approaching a $400 trillion shortfall, and mathematically may not survive much longer in the U.S. even if fully funded. 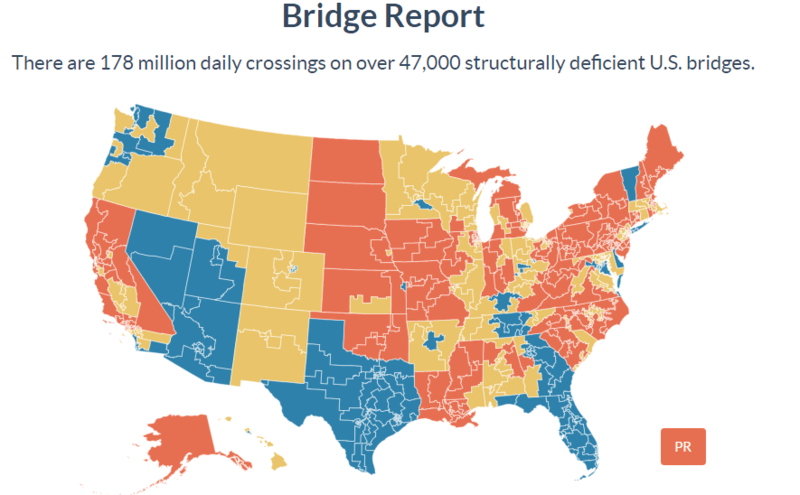 Meanwhile, the American Road and Transportation Builders Association (ARTBA) shows there are 47,000 structurally deficient bridges across the U.S. You can view the map here. The map shows three different colored areas. The blue areas show 0 – 4.9% deficient bridges, the yellow areas show 5 – 8.9%, and the red areas are 9% or higher (almost 1 out of every 10 bridges). According to the map, there are over 178 million daily crossings on those structurally deficient bridges. That works out to almost 3,800 crossings per bridge on average. And this is just bridges… we haven’t even accounted for roads! So infrastructure is as much of a crisis as pensions are. Since States have a limited budget, which problem will they focus on? Assume a high interest rate, and present contributions grow and compound at a rapid rate, which easily fulfill promises to retirees in decades hence. Conversely, lower rates require higher current contributions to meet those future promises. Lower rates appear to match the current reality, however. So retirees who were promised a decent return for their contributions are now being left stranded. As the 2020 elections approach, neither of these crucial problems is getting much attention. Infrastructure was a buzzword in the 2016 elections, but not much has happened since. As for public pensions, they’re not Washington’s problem. The crisis is not being completely ignored, as “solutions” have been in discussion. However, the most recent appear to be toll roads or congestion taxes. Neither solution is appealing. Round and round we go, where this political “merry-go-round” stops, nobody knows. But it sure seems like the state isn’t going to help much. This particular “either-or” crisis could be here sooner than expected, and states don’t appear to be able to deliver on politician’s promises. It’s time to consider building “self-reliance” into your retirement. This involves diversifying your assets into a variety of investment risks and categories such as physical gold and silver as a way to take control and protect your savings. Don’t wait to see if the states choose to help you because chances are, they won’t.